...And mine arrived this afternoon. Just stunningly beautiful, and the picture does it no justice whatsoever. You have to hold one in your hands, weigh its heft, feel the clicks as you wind the handle, peer at the little digits. Yes, it's a Curta Type I mechanical calculator, affectionately known as the peppermill. This one is probably from April 1964 (there's a whole lore about how to date one of these little beauties — I used the Curta, for practice) and if electronic calculators killed the slide rule, this engineering marvel was blown to smithereens by their arrival. And it's such a shame. Essentially it's a standard mechanical calculator, with the linear carriage wrapped into a cylinder. Yeah, "essentially", indeed. 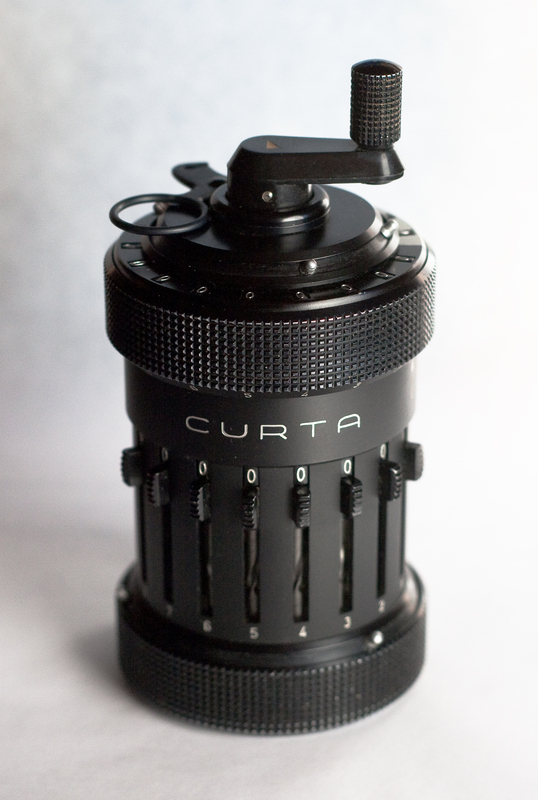 The Curta Type I has 8 digits of slides, an 11 digit product or result dial, and a 6-digit quotient or counter dial (the manual calls this configuration 8 x 6 x 11, with the larger type II being 11 x 8 x 15). It can do addition, subtraction, and through a clever system of raising, rotating, and lowering the carriage, multiplication and division. Pride of place, this one.